Aestus is not a battery system, and it’s unlike any other thermal solution. Aestus Energy has developed a new energy storage system, emerging as a market leader to challenge existing storage solutions. The Aestus heat-to-power system improves on a basic thermodynamic process to efficiently convert electricity to heat, store the heat, and later convert it back into electricity. The Aestus system resolves many of the dangers and limitations of most energy storage solutions now on the market. Safe, environmentally-friendly, and designed to last for decades. What is new? 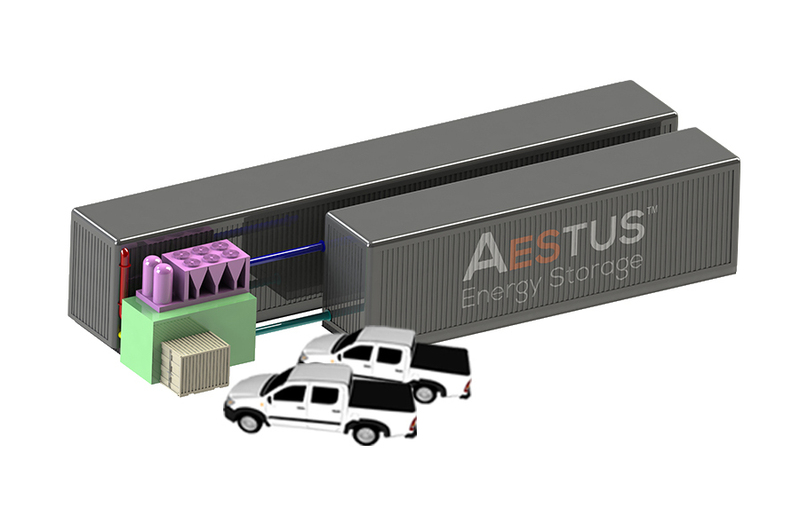 The Aestus Energy Storage system is not a conventional chemical battery, and it is not like other thermal solutions. Unlike batteries, Aestus has no materials that are caustic, toxic, or a fire-safety issue. Aestus is also a different kind of thermal energy storage system. It is not HVAC (Heating, Ventilation and Air Conditioning), which stores heating and cooling for later conditioning of building/work spaces; and it is not a molten salt, cryogenic, or solar-pond thermal process. Advantages of the Aestus solution. Aestus achieves higher efficiencies – with virtually no performance degradation during its long use-life. Round-trip efficiency of the system reaches over 70%. Additionally, the heat-to-power design involves no decay, memory, or charging issues that exist in battery storage systems. System life expectancy is 20+ years. And use-life may be extended further, with inspection analysis or upgrade of system components. Also, no derate required – Aestus delivers its full-rated energy at full nameplate power over its design life. No hazardous chemicals operate within the system – eliminating the risk of chemical reactions or explosive ’thermal run-away’ conditions found in battery solutions. Zero environmental impact – no harmful emissions, and more sustainable materials. The Aestus system’s long discharge duration provides greater flexibility for the needs of each application. Discharge cycles of more than twice daily, delivering over 5 hours at full-rated power and configurable for longer operation – up to 10 hours of discharge. Higher energy density means less space is required for the same storage capacity. The Aestus system is compact and modular, and additional units can be easily put in place to meet future expansion needs. Lower lifetime costs are due to lower initial capital investment, as well as lower costs for operations and maintenance. LCOS/E (Net Levelized Cost of Stored Energy) is also expected to remain much lower than for other storage technologies. Safe and flexible, even for more challenging site conditions. The Aestus system is essentially a “Heat-to-Power” process. It uses a closed-loop thermal cycle, passing the working fluid through rotating machinery to generate heat during the charge cycle. Later, the stored heat is used to generate electricity in the discharge cycle – through thermal expansion. The discharge process is basically a reverse cycle, from a systems perspective. Round-trip cycle efficiency is over 70%. The system provides instantaneous power on demand, and can be configured to provide varying amounts of energy, for different time periods – from 1 hour or less, up to 10+ hours. Better Grid-level and Commercial / Industrial energy storage solutions. How can we help keep your business running?